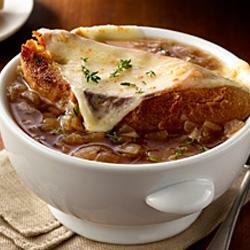 French Onion Soup - Training Day Fitness, Inc. Melt butter in medium saucepan over medium heat and cook Recipe Ready Chopped Onions, stirring occasionally, 15 minutes or until golden brown. Add beef broth and thyme; bring to a boil over high heat. Simmer 5 minutes. Season, if desired, with salt and black pepper. Arrange 4 oven-proof soup bowls on baking sheet and evenly fill with soup. Arrange toast in each bowl and top with cheese. Broil 1 minute or until cheese is bubbling.